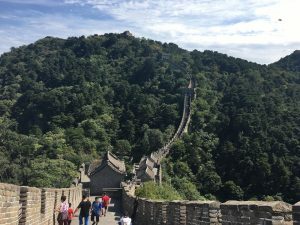 Alright, alright, I know I said last time that my next blog post would be about our second stop on the Silk Road excursion, but today, we went to the majestic Great Wall of China, and you know that I just have to tell you all about it. The weather had looked like it was going to be overcast all day. 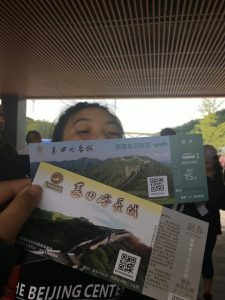 There was some worried chatters about the chance of rain later in the day, but regardless of what the weather was going to be like, I was ridiculously excited to be going to the Great Wall. Up until today, it was only something that I’ve heard about in textbooks and seen in pictures, and now, quite proudly, I can say that I’ve seen it, touched it, walked around on it, and boy, oh boy, did I take a load of pictures on it. We left campus around 8am on a bus, which was graciously arranged by TBC. I had some fruit for breakfast before passing out on the 1.5 hour ride to the site (most of us did), waking up to some clean, fresh air and pleasantly cool weather. The skies were still a little overcast, but it felt like the sky was perking up a little bit as the afternoon approached. I remember Ryan, the director of student development at TBC, who went with us on this little excursion, commented that we seemed lucky in terms of weather. Later, after our time was up at the Great Wall, he would say that we were extremely lucky, since he remembered there being a thick fog that covered the mountains the year before, blocking much of the views. After getting off of the bus, we walked over to the ticket area, about a 5 minute walk. All of us were really lively, goofing around with each other and discussing our upcoming time on the wall. The weather was getting brighter and brighter, and the clouds were clearing overhead, seeming to reflect our happy moods. It seemed that we were really lucky after all. As pictured, we got two tickets: one ticket for gaining entrance onto the wall and one for the shuttle bus. The shuttle bus drove us closer to the wall before dropping us off. From there, we had two options. We could have either hiked the stairs all the way up onto the wall, or, for a price, we could take a ski-lift type contraption (they called it a cable car) that lifted tourists up to the wall. 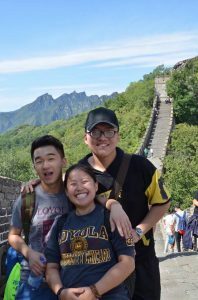 My friends and I decided to do the hike, just so we all could triumphantly say that we climbed up to the Great Wall of China. 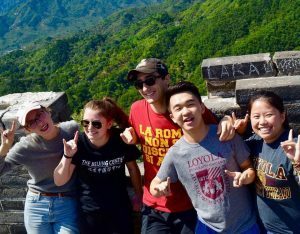 After all, when in China, hike up to the Great Wall, right? I kid you not, there has not been another time where my legs have burned hotter. There must have been at least 20 flights of stairs, majority of them being pretty steep. It took us maybe around 30-45 minutes to drag ourselves up all of those stairs. 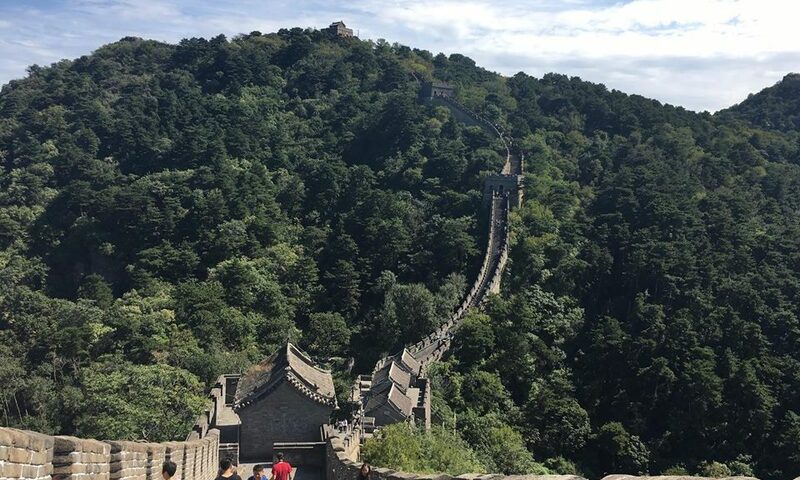 Like, that hike was beautiful, sure, and now I can definitively say that I hiked up to the Great Wall of China, but if you asked me to do it again, I would politely and aggressively say “nah fam.” If the day had been hotter, I’m certain I would not have made it up those stairs. We were extremely lucky in terms of weather, indeed. Me, tomato-faced, clearly not amused with that hike. The Great Wall is just behind me. Anyway, once I actually got to the wall, my exhausted-ness pretty much melted away (well… eventually). The view was absolutely breathless, with the impressive green mountains and the blue skies in the background. In the distance, we could see the rest of the wall snaking in and out of the mountains and forestry like an ancient gray dragon. It’s indescribable to witness, let alone walk along, such a majestic structure, hundreds and hundreds of years old. To touch the bricks and to walk along the path that soldiers of ancient dynasties walked along was unbelievable. The sun came out and the skies completely cleared up, revealing that deep beautiful blue color. 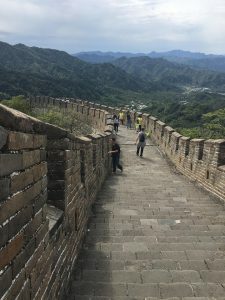 It became an amazing day for us to take pictures and to explore that small part of the Great Wall (the actual length of the wall is around 5,000 miles!). 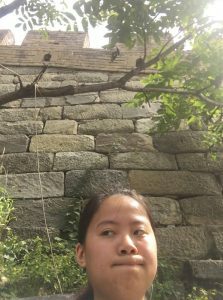 Me on the Great Wall! Because the wall was built in a mountainous area, the path along the top of the wall had stairs going up and down, depending on the terrain. So you could be walking down a really steep decline for one section and then you could be hiking up some stairs again in another section. The Great Wall snaking into the mountains. All of us were not afraid to be tourists and took LOTS, and I mean LOTS, of really adorable and heart-warming photos. I was all smiles today. I felt so comfortable, and I felt like I was a true part of this amazing experience with everyone in the TBC program. 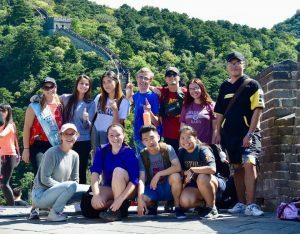 The feeling of togetherness, feeling like I belonged to this group of study abroad students, was… quite fulfilling and comforting. We all were experiencing this ancient piece of history of a country whose culture is richer than any one of us had thought together. I think our many photos captured that pretty well. Disclaimer: there are many, many, other photos that we took other than those pictured below (in case you guys didn’t get that, yet). These are just some of my favorites. Showing some LUC Rambler pride! 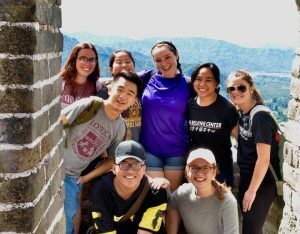 TBC at the Great Wall! 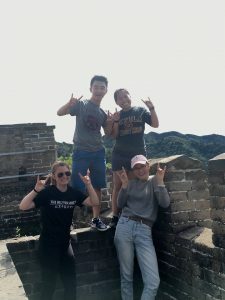 We spent about an hour and a half on the Great Wall, taking copious amounts of pictures and enjoying the weather and each other’s company as we walked along the path. Before we knew it, it was time for us to return to our bus. But how in the world did we get back all the way down, you ask? 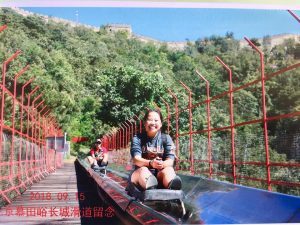 For those of you who aren’t familiar (as I was when I first heard about it), a toboggan is literally a giant slide, where you sit on like this little black sled with a lever that you can use to control your speed and you slide down however far the slide goes. If you pushed forward on the lever, you went faster, and if you pulled the lever towards you, you slowed down. The exhilarating feeling is similar to riding a roller coaster, only it’s a really smooth ride and you get to control how fast you’re going. I was whooping and laughing the entire way down, since my friends and I basically pushed that lever down as far as it could go for most of the ride down. At some point in the ride, you were instructed to slow down and smile for a photo shot. Once we finally got off of the slide, we were able to look at our photos. Below is my picture; I was really fond of it, so I bought it for memories’ sake. 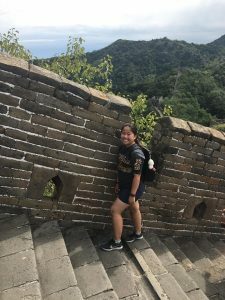 I think it really nicely sums up my positive feelings about the day, with the blue sky, the Great Wall in the background, and my smile as bright as the sun shining down on me. That’s about it for now! I promise that next time, we’ll get back to our Silk Road excursion! I can’t wait to share what else we were up to for those two weeks!